We need your help. On April 6, 1917, America entered World War I. Almost immediately, American Indians from across the United States volunteered in large numbers to protect and defend their homelands. 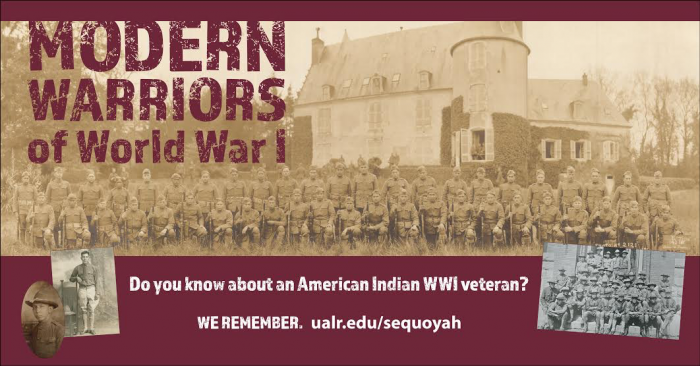 We have created the Modern Warriors of WWI database to identify all 12,000 American Indian servicemen. Our goal is to create as complete a record as possible, so that their legacy of bravery and sacrifice will be remembered. The searchable database can be found here on the “American Indians in WWI” webpage as part of the U.S. World War I Centennial Commission’s website. Please submit your veteran’s information in the form below. Photographs are welcome. Send comments or questions to Erin Fehr at ehfehr@ualr.edu. This form is used to gather biographical information on American Indian servicemen for the Modern Warriors of World War I database, which will be made publicly available.